All of Aromatic Essentials products are 100% Vegan, except for this one. 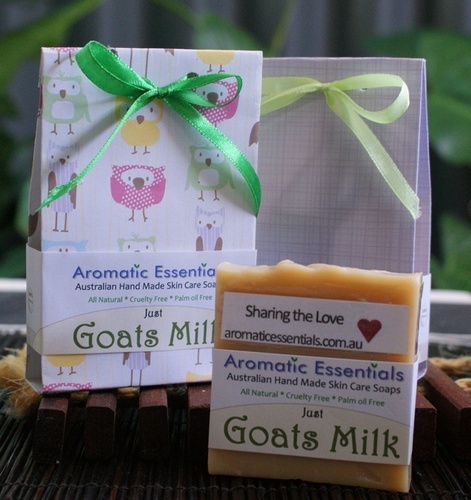 Goats milk comes from the nice couple on the hill in Mullalyup. I make a select few of these soaps only because some people with insufferable skin conditions are immensely improved by using this product. Eczema and Dermatitis or Psoriasis? This is the ticket to soft, calm and balanced skin. These soaps are extremely high in saturated fats, vitamins, Essential Fatty Acids, Minerals and so much nourishment, your skin will love it. Pure and creamy gentle soap for sensitive skin. Beautiful lathery soap! Suggested uses - Facial wash, children, dry skin, shaving. Ingredients Oils of Olive, Coconut, Organic Castor, Rice Bran, Shea butter, Cocoa butter, Organic Hemp Seed oil and Goats Milk. Great for problem skin. Detoxifying Facial soap. Normal/Combination. Clays draw toxins out of the skin via the pores. Creamy soft soap with bubbly lather. Ideal for face washing against acne, or for shaving. Ingredients saponified oils of Olive, Coconut, rice bran, Organic castor, Shea butter, Cocoa butter, Organic Hemp seed oil, Goats milk, Kaolin Clay, Organic White Clay, Activated Charcoal (Cosmetic grade), Pink Clay. Pink Mica. Essential oils of Vanilla, Ylang Ylang. NO chemicals, No detergents. All NATURAL guaranteed!